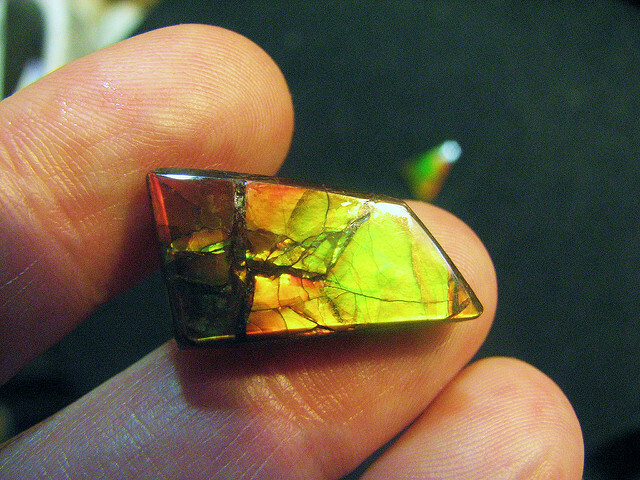 Ammolite is a rare, gem-quality, iridescent material. It’s cut from the fossilized shells of extinct ammonites (ancient sea creatures) found only in the Bearpaw Formation in Alberta, Canada. With a wide range of dazzling colors and patterns, this organic gemstone is highly desired for freeform natural cabochons and assembled jewelry pieces. 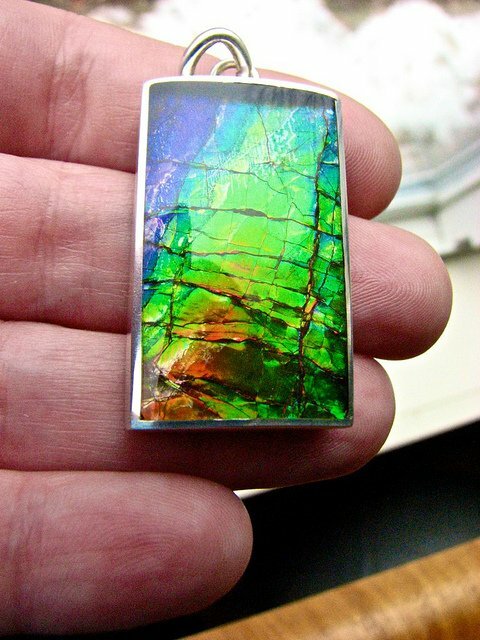 Ammolite “naturals” are freeform cabochons with a non-coated hand finish. They’re backed by the original shale of the fossil and can range in size up to 10 carats and 6 inches across. These are priced by carat weight, but the backing thickness shouldn’t exceed 1.5 mm. 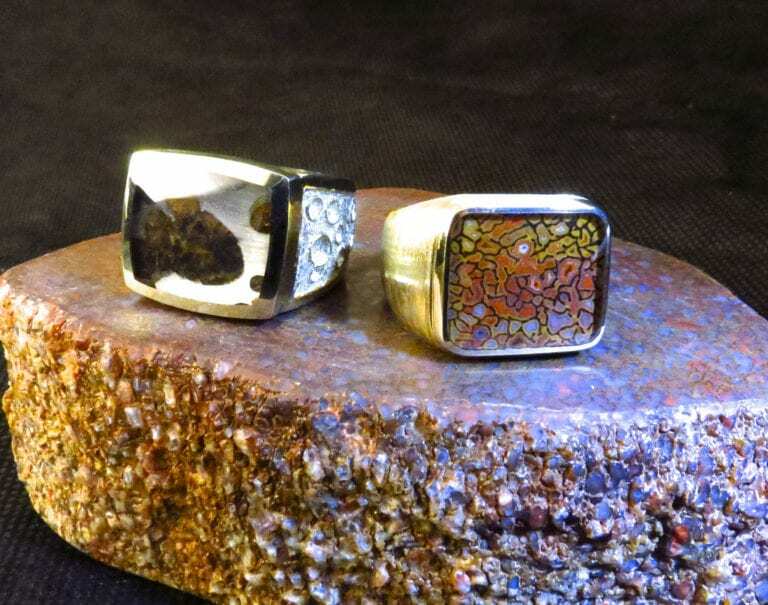 Doublets are freeform cabs bonded to a backing. 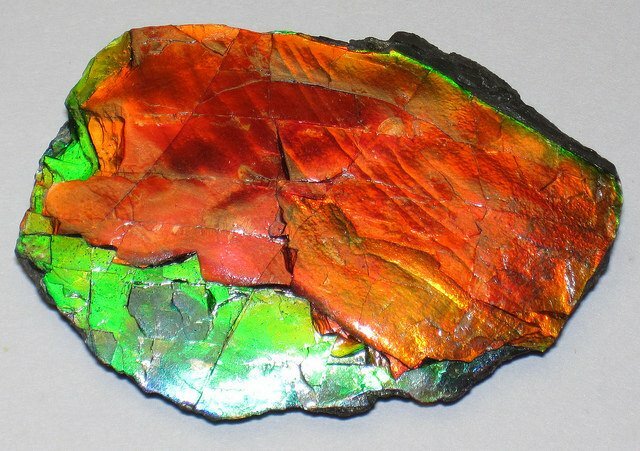 Ammolite triplets are usually constructed on a dark gray wafer of natural shale (1) below a thin layer of ammolite (2). On top, there’s usually a calibrated cap of optical quartz or synthetic spinel (3). 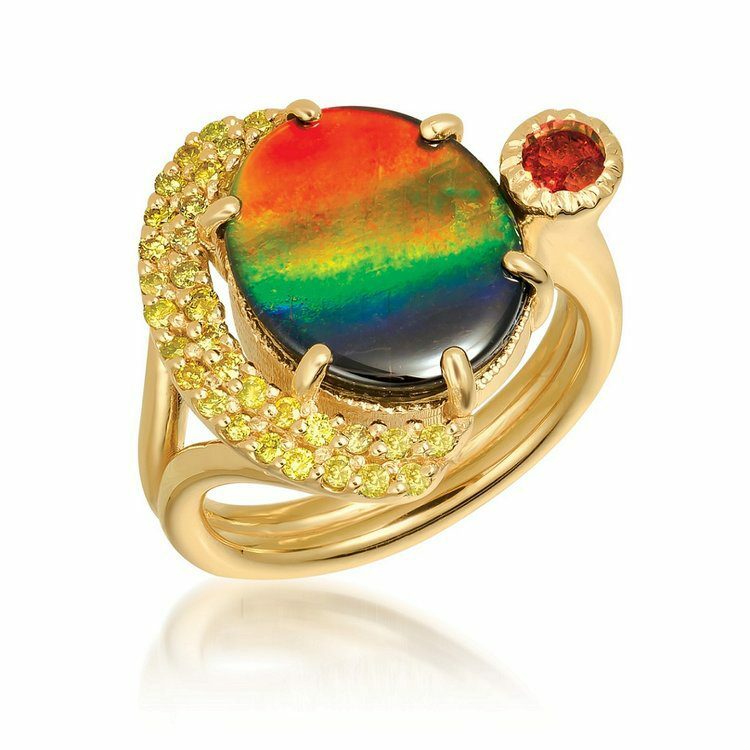 This structure allows the ammolite to show the most brilliant flash while protecting it in a setting durable enough for everyday jewelry wear. The ammolite industry has yet to agree on any one grading system. However, most systems refer to color, brightness, iridescence, etc. 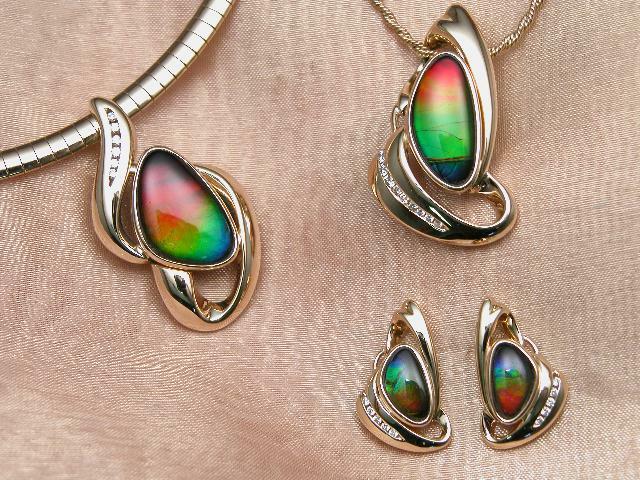 Colors Ammolite can be found in any color known in nature or the imagination. It can also have a vast array of color combinations in every square centimeter. See "Comments" below. Transparency Opaque, thin sheets used in assembled stones may be translucent to transparent. a = 1.520; γ= 1.670. From ammonite, the fossils of an extinct cephalopod with a spiral shell like a ram’s horn. Ammonite was named after the Ancient Egyptian god Amun, who was represented with ram’s horns. 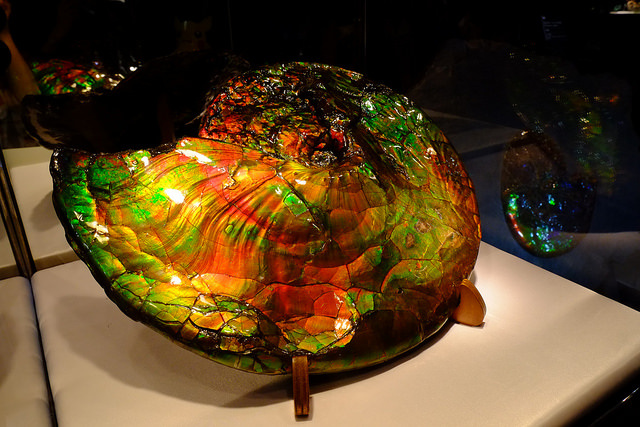 Although the terms ammolite and ammonite are sometimes used interchangeably, ammonite, strictly speaking, refers to the fossil shells of ammonites, whether they are gem-quality or not. Ammonites were marine mollusks that became extinct around 65 million years ago. There were many species of ammonites. Their fossils have been found across the globe. The ones that yield gem-quality ammolite are Placenticeras meeki, Placenticeras intercalare, and Baculites compressus. This material has only been found in Alberta, Canada. Other gem-quality ammonite exists, such as lumachelle, which is cut from the fossils of Carnites floridus found in Austria. 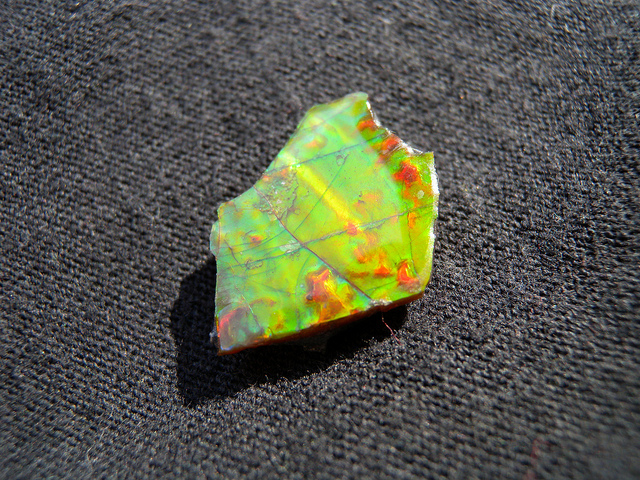 Although this iridescent material resembles ammolite, it’s a different mineral. Only about 5% of the ammonites found in Alberta have any suitable gem material. This is only found on the shell surface. Of that amount, only about 20% of the shell can be used. Fossilized ammonite shell is comprised primarily of aragonite (the major constituent mineral of pearl) with trace elements of aluminum, barium, chromium, copper, iron, magnesium, manganese, silicon, strontium, titanium, and vanadium. The iridescent outer layers may be 0.5 – 8 mm thick before polishing and 0.1 – 3 mm thick after polishing. A higher grade ammolite gem will have either a very strong, bright single color or a range of bright colors. These gems can show any color of the rainbow. (Sometimes they seem to show more than that!) 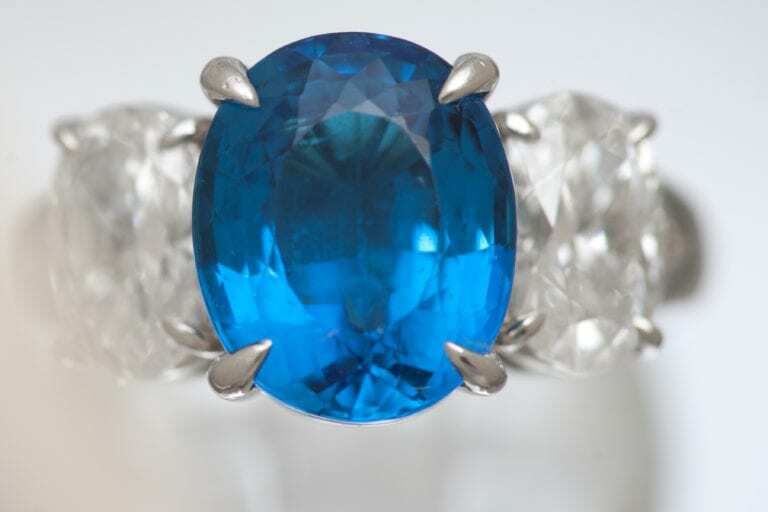 Lower grade gemstones will show less vibrant colors in a more limited range. Generally, red and green are more common than blue or purple. Certain hues, like crimson, violet, and gold, are very rare and in high demand. The geological layers in which ammonites fossilized affected the formation of these patterns. (See “Sources” below). 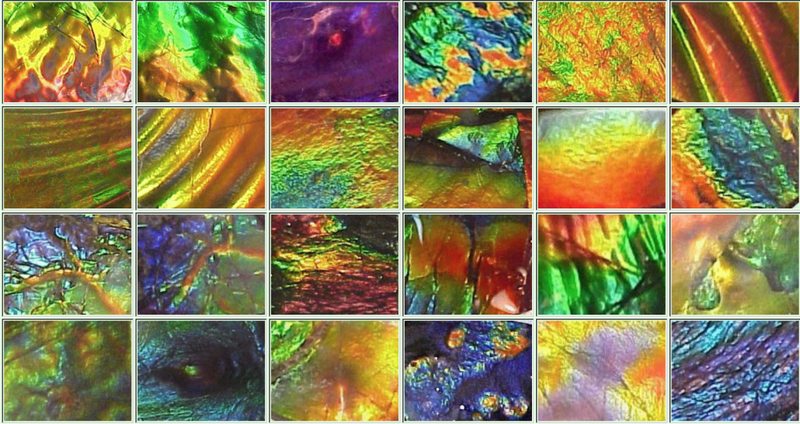 Iridescence is the property that creates the incredible colors across the surface of ammolites. The surface of gem-quality fossil shells is composed of closely-packed, tabular crystals of aragonite, with their c-axis oriented vertical to the shell surface. They’re united into thin lamellae (plates or scales). The thickness of the aragonite lamellae is of the same scale as the wavelengths of the spectral colors that make up white light. Thus, when white light enters the regularly spaced, thin layers of aragonite, diffraction occurs. Flashes of spectral colors are seen. The plates of aragonite crystals vary in thickness: ordered, thick stacks for red gems, less ordered, thinner stacks for green, and unordered, very thin stacks for blue ones. Additionally, trace elements are randomly arranged and interspersed with inclusions of organic material (conchiolin). These factors determine the colors and intensity of the diffraction. The best gems will have brilliant, vibrant iridescence, continually dancing with changing colors as the angle of incident light changes. 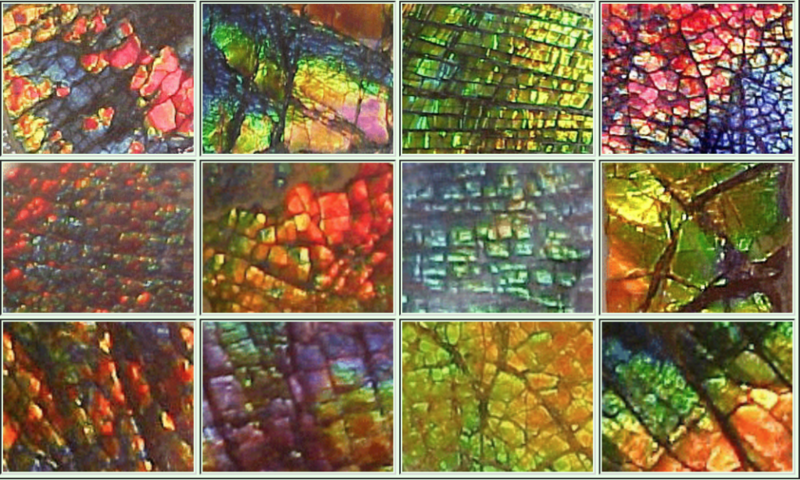 The color of ammolite depends on the angle of light and the viewer’s perspective. Sometimes, a chromatic shift occurs. (Sometimes this is subtle; sometimes this is spectacularly dramatic). Red will shift to green, green will shift to blue, etc. This shift is called dichromatic. Some gem material will have shift restricted to hues within the same primary color group. This shift is called monochromatic. The best material has spectrochromatic shift. The color will shift through the entire spectrum depending on the light source and angle of observation. Some material won’t show strong, vibrant colors through 360° of rotation. When these stones are rotated, the brightness decreases and darkens to black. This is due to organic inclusions in the aragonite blocking light wave diffraction. For a gemstone to be highly graded it must show a brilliant color through 360° of rotation. Gems are sometimes treated with lacquer or Opticon fracture sealer for stabilization. Ammolite is only found in the Bearpaw Formation, which extends from Alberta to Saskatchewan in Canada and south to Montana in the US. The best gem-quality ammolite is found along high-energy river systems on the eastern slopes of the Rocky Mountains in southern Alberta. Most commercial mining operations have been conducted along the banks of the St. Mary River, south of Lethbridge. 75 to 70 million years ago, this was the northwestern edge of the Bearpaw Sea (also known as the Western Interior Seaway). This shallow, warm body of water teemed with life. One of its most prolific inhabitants was the ammonite. These creatures thrived in every ecological niche open to them. They were deep-water bottom feeders as well as jet-propelled predators. Ammonites had big brains, too. 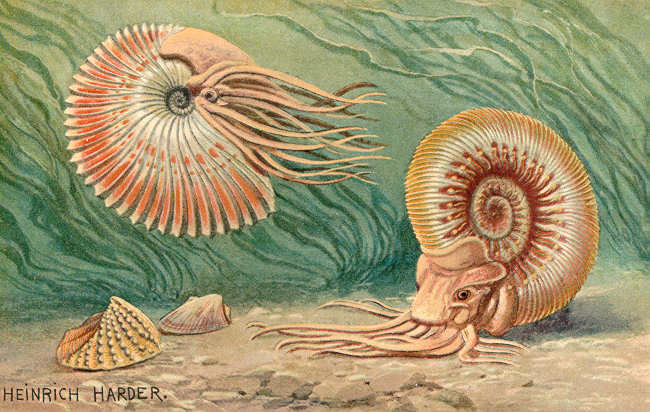 “Ammonoid,” Paleoartist Heinrich Harder’s (1858-1935) reconstruction of some ammonites as they would appear in life. Public Domain. Cataclysmic volcanic activity from the growing Rockies periodically covered huge areas with meters-thick ash. As the ash settled slowly on the shallow ocean floor, it killed all life below. Their remains were sealed in a heavy, semi-impermeable layer of mineral rich clay (bentonite). Over time, the St. Mary River area was buried in ash over 4 km deep. Through many glacial periods, the area underwent geological uplift and, eventually, surface exposure. High concentrations of iron and magnesium created a regionally unique condition, which led to sedimentary digenesis. This impeded the oxidization process that converts the aragonite of the ammonite shell to stable calcium carbonate (CaCO3). 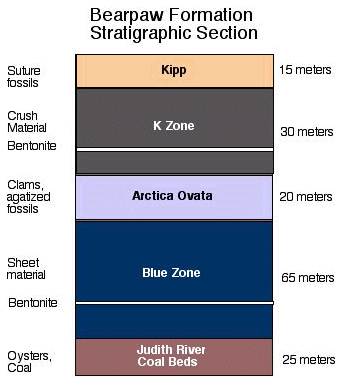 Protected by either large ironstone concretions (siderite or FeCO3) or a thin layer of iron pyrite (FeS2), ammolites formed in two distinct geological horizons known as the K Zone (crush) and the Blue Zone (sheet). The infill rate of seaborne sediment into the ammonite chambers could explain the difference between crush and sheet material of iron pyrite. K Zone Ammolite: Always found in concretions, compacted and fractured through deposition and naturally sealed with a carbonate or conchiolin. Found 30 meters below the top of the Bearpaw Formation. 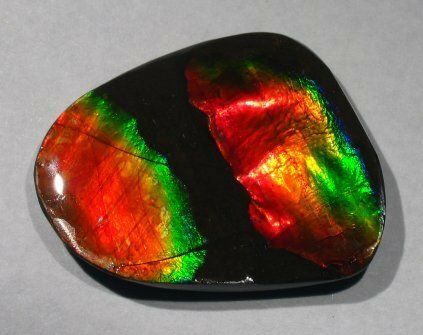 Blue Zone Ammolite: Sometimes found in concretions, usually found compressed with a thin layer of iron pyrite. Compacted with fewer or no fractures. Rarely mined, hand collected in a horizon 120 meters below the bottom of the Bearpaw Formation in river valleys. Freeform “naturals” are best suited for brooches, pendants, or earrings. Triplets are best suited to rings. The care recommendations for pearls also apply to ammolites. Avoid using mechanical systems like ultrasonic and steam cleaners. Cleaning with warm, soapy water and a brush is recommended. Excessive heat, acids, and some perfumes or hairsprays may damage gem or cause a loss of iridescence. Triplets may be cleaned in ultrasonic systems. The cap should protect the ammolite from scratches. However, make sure you suspend your piece off the bottom of the machine. Strong jolts during cleaning could separate the layers. Consult our gemstone jewelry cleaning guide for more information.